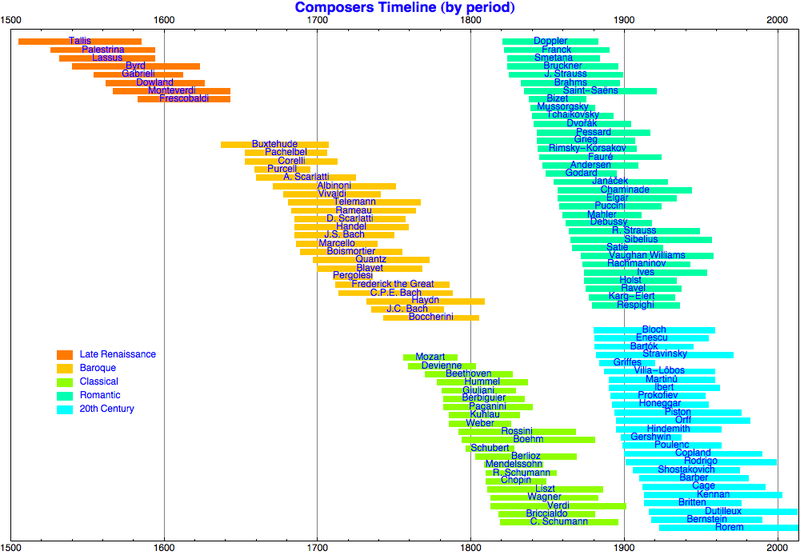 I made a list of composers and used Mathematica to generate a timeline. Gee, that makes it sound a lot easier than it actually was. Anyway, my list is skewed somewhat toward the flute world with composers like Quantz, Blavet, Karg-Elert, Kuhlau, Frederick the Great, and several others. Also, I made some decisions about where to start and end various musical periods for the sake of categorizing the composers. Only the latter part of the Renaissance period is displayed to keep the graph from being too wide. If you hover your mouse over a composer's name, tooltips will give you a little additional information, including the place of birth. If you click on a composers name, the corresponding Wikipedia page will appear in your browser. This file was last modified Friday, 22-Jul-2016 08:15:10 PDT.